This picture shows a checkerboard with one square colored incorrectly. This demonstrates spatial frequency masking. Blurring the image or viewing it from a distance places some of the mask's higher frequencies outside of the window of visibility, therefor making the target easier to see. Explanation: Our behavioral studies in neglect have demonstrated residual (or implicit) processing of stimuli on the affected side, even when these fail to reach awareness. 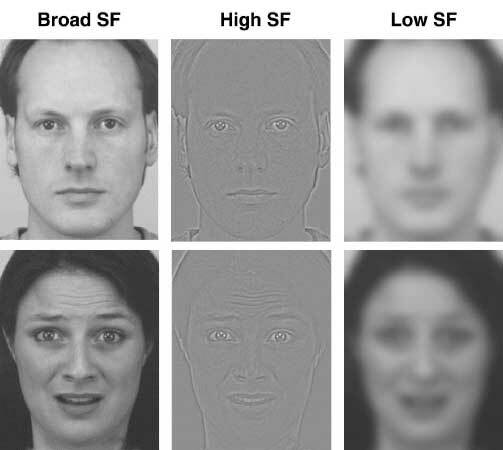 Such residual or unconscious processing may include perceptual mechanisms that can still operate in the absence of spatial attention, e.g., basic grouping mechanisms relying on visual areas spared by the parietal lesions. For instance, we found that neglect patients with parietal damage only (and intact occipital cortex) could still process illusory figures that were spatially discontinuous but connected by subjective contours (Kanizsa figures), suggesting that the grouping of discontinuous features into a single subjective figure may occur despite spatial neglect. By contrast, patients whose lesion extended into occipital cortex showed no grouping effects. 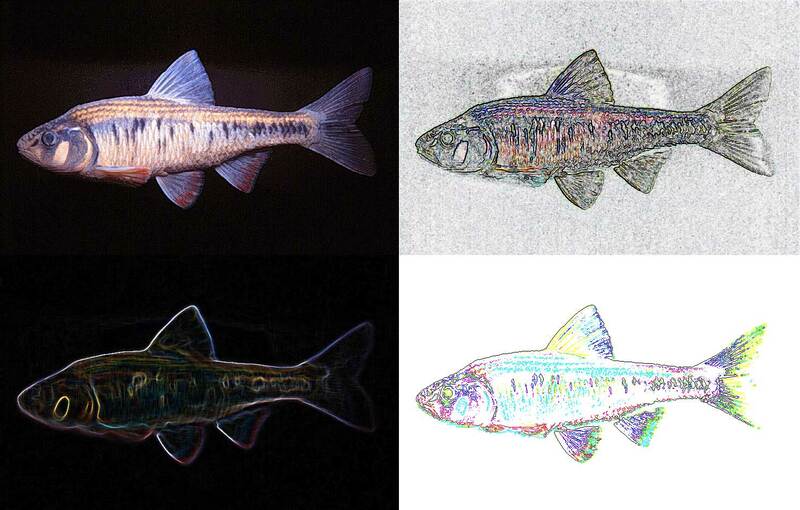 A biologically-motivated model for contrast detection in images - the iterative orientation tuning model - has been developed at the Fraunhofer Institute for Media Communication. The model has been inspired by a regular orientation preference layout of simple cells in the primary visual cortex of mammals. 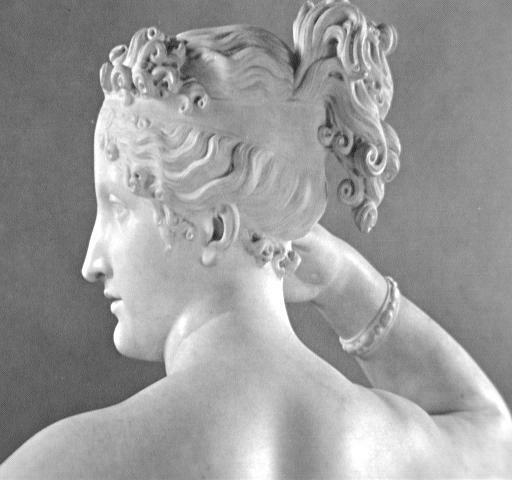 The model allows the efficient detection of contours in complex images. Successive steps in a Fourier synthesis of a complex pattern by the addition of progressively greater number of those components which have the highest amplitudes. 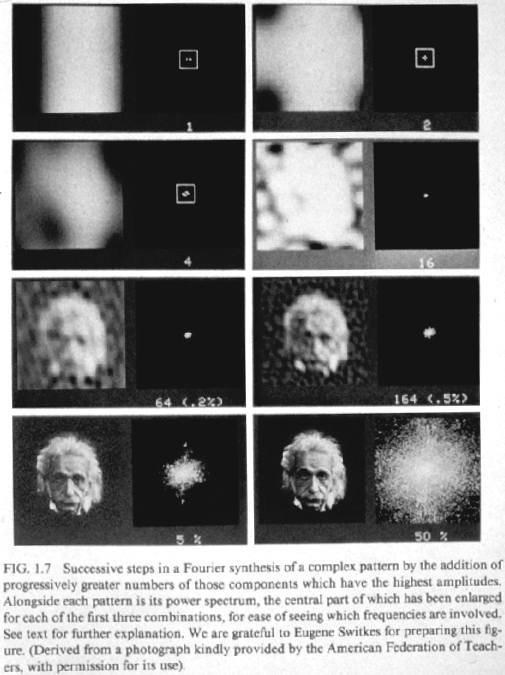 This image exemplifies the Fourier transomation...How you smooth an image which can correspond to Gaussian blurring. Yet another example of the spatial filtering we saw in the book. 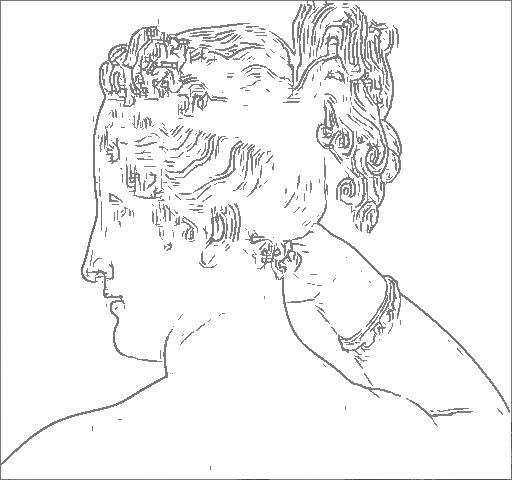 The idea of being able to filter out parts of an image in the frequency domain is pretty neat, and the idea that our eyes/brain may be able to do this on a very low (ie not symbolic) level is even neater. Tooling around in Photoshop CS one can see (hopefully) some of the latest and greatest edge-detection algorithms. 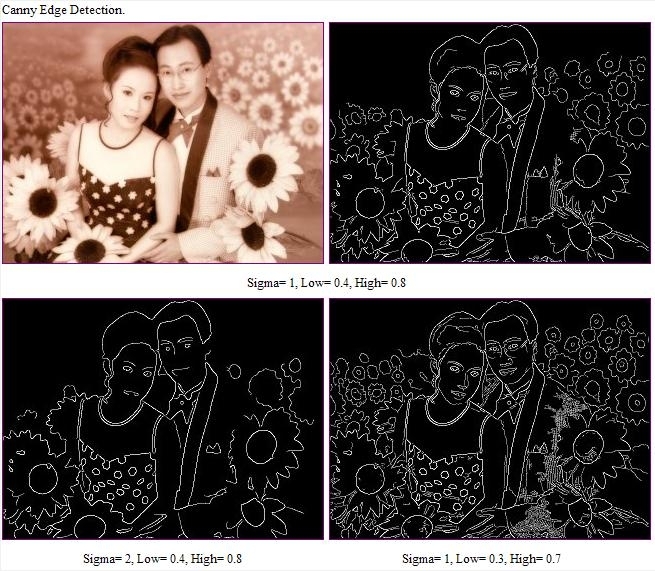 Note that all of these algorithms have tackled the difficult problem of locating edges in full color space. 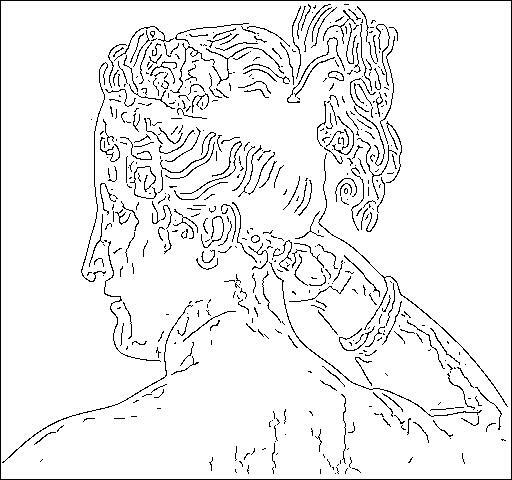 I've attached three images to contrast a couple different edge detection techniques as applied to Paolina, a popular subject for computer vision testing. 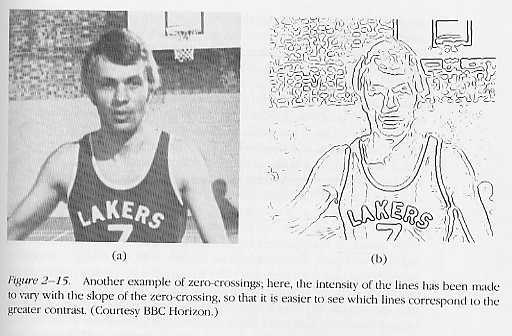 Canny is a popular edge detection algorithm mentioned by Palmer. The .gif image shows how motion and color perception are different as mentioned at the end of the chapter. If you view the image zoomed out or from far away the green and blue will barely appear to be moving because they have relatively the same luminance. The green and black will still be obviously moving. 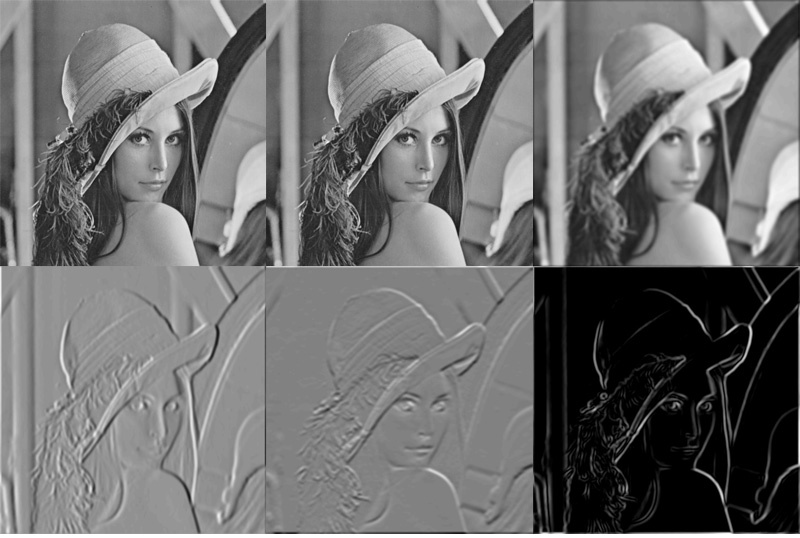 The .png image shows the edge detection convolutions mentioned in the book. 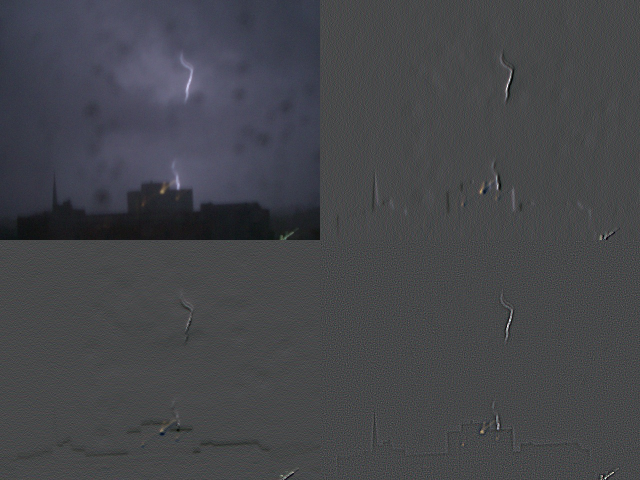 The top left corner is an image I took this summer of a lightning bolt. To the right of that is the first degree convolution for detecting vertical edges, and below it is the first degree convolution for horizontal edges. 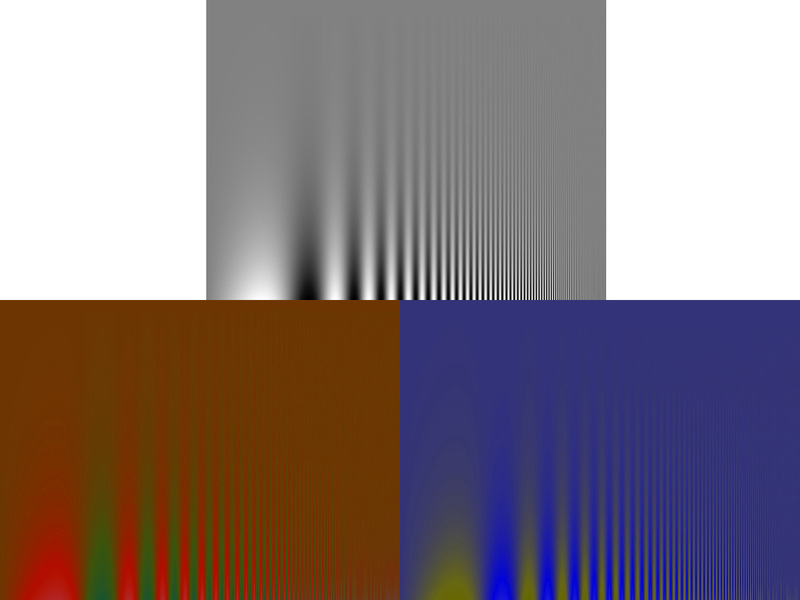 The bottom right is the second degree convolution in all directions. The convolution images were modified slightly (contrast and such) to make them more visible.